There’s a lot more to the Grand Canyon than can be seen from the top. Walk seven miles down and you arrive at the river that created the spectacular chasm, the Colorado. Stay overnight at a rustic lodge at the bottom, and you begin to get a different sense of scale about the place. 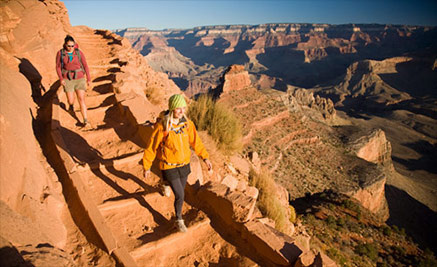 California-based outfitter OARS has designed a four-day trip for hikers who want to experience the canyon from top to bottom. Before the big descent, participants see red sandstone spires and big canyon walls on guided hikes at nearby Walnut Canyon and Wupatki national monuments. Then it’s on to the main attraction. The group stays on the South Rim in Grand Canyon National Park before heading down the South Kaibab Trail. The night is spent at Phantom Ranch, which features cabins and a dormitory-style lodge reachable only on foot or by mule, before a nine-mile hike back to the top the next day. Selected trips in this series are led by veteran guide Andre Potochnik, who has a doctorate in geology and has led river trips in the canyon for more than four decades.